This upcoming handset is expected to feature a Qualcomm Snapdragon 820 chip and at least 64 GB of internal storage, as well as a rotating camera. Rotating cameras have been around for many years, but only low-end, no-name handsets from China seem to be using them these days - except the Oppo N3, of course. However, ZUK is not just another Chinese brand, since it is backed by Lenovo and the upcoming ZUK Z2 smartphone does not look bad at all. According to a few recently leaked renders, the upcoming handset will hit the market using a single rotating camera. These are unofficial images, but this handset has been in the rumor mill for a while already, and the processor inside it is expected to be the Qualcomm Snapdragon 820. While the ZUK Z1 is available with a generous 64 GB of storage, its successor should feature at least that amount as well, but it would not be a surprise to see it packing 128 GB. 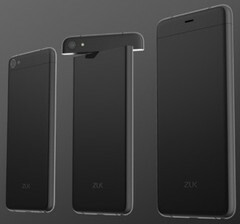 All the above should be taken with a grain of salt for now, but maybe ZUK Z2 shows up in time for the Chinese New Year in early February. We will get back to it as soon as that happens, so stay tuned.